A lot of high-end gyms have switched to urethane dumbbells, but a lot of good gyms still have pro-style dumbbells. They’re NOT standard adjustable dumbbells. Those are the types with spin-lock or other collars that you can easily remove, and the long ends of the dumbbell always stick out and poke you. 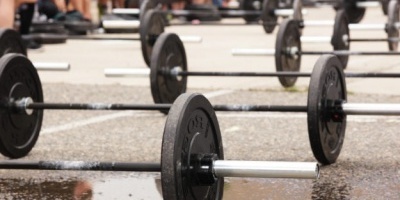 If you want adjustable dumbbells instead, see our article comparing the best adjustable dumbbells. Last I checked, the pre-assembled Troy dumbbells we sell are not any more expensive than buying all the parts yourself and doing the work. If you already have a bunch of standard plates, or you have some pro style dumbbells you want to reconfigure to different weights, then it might make sense to buy the parts you need. Or if you plan on reconfiguring them later as you get stronger. But it’s always nice to keep lighter dumbbells for some awkward exercises and warmups. Also, Troy’s dumbbells are mad tight. They do not want anyone loosening their dumbbells. They say it has to do with their Troy logo being on it and not wanting to let people modify their product, and I imagine they don’t want any complaints of the bolts loosening either. 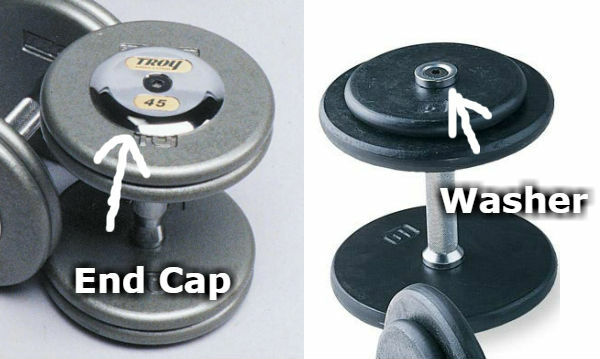 Bottom line, if you plan on re-configuring the weight, you won’t be able to do it with Troy’s preassembled dumbbells. I’ve had customers who managed to get the bolt off with some good tools and a heat gun to loosen things, but in most cases I don’t think it’s possible to do it without stripping the bolt, forcing you to drill the hell out of it with a titanium bit. Here’s a handy chart that should help you pick the plates and handles you need. This is for each dumbbell of a given weight. Double it for a pair. Any brands of handles and plates are pretty much interchangeable, but I recommend you at least use the same brand of handle for each pair of the same weight because of slight differences in the grip size or knurling that would get irritating. We sell the handles, end caps and plates at our store. If you want to save some money and skip the end caps, that’s fine. All handles come with large, thick washers that are not as big and smooth as end caps but at least cradle the bolt so you aren’t poking yourself with the bolts coming out the ends. One issue with skipping the end caps is your dumbbells are going to be a little more underweight or overweight. Normally the handle + end caps come out to just under 5 lbs for the lighter weight (shortest #1 handle), then graduating to exactly 5 lbs and then over 5 lbs for the heaviest weights (longest #10 handle). The longer handles themselves weigh more than the shorter ones, and you therefore will be jumping up in slightly more than 5lb increments for every 20lb increase in weight where you move to the next size handle. So I hate to break it to you, but you’re doomed to have dumbbells on the light end being a little underweight and/or dumbbells on the heavy end being slightly overweight. Personally I don’t think it’s a big deal. Don’t try to get tricky and start taking away a little weight on the long-handled heaviest dumbbells to offset the handle weight. That would make you start jumping up in less than 5lb increments. Even in the worst case you’re only going to be off by a few pounds at one end of the run. Just deal with it. Most plates you buy for this are not guaranteed within any % of weight and might be off by as much as 5%, so it’s going to be a little messy regardless. The important thing is to just figure the weights will be off a little on the heavy or light end of your set and to make sure you follow a chart and go up in exact 5lb increments. That way you’ll make it easy on yourself, trust me. However, if you want to get fancy by weighing each assembled dumbbell and labeling it with the exact weight, that’s not a bad idea. Tracking your progress is a bit easier that way if you sometimes lift in other gyms and need to be consistent. But then you have the problem of wondering whether the ones at the other gym are accurate, right?